Google has offered many forms of webmaster communication where they answer questions live. From conferences, workshops, live chats, YouTube Live and so much more. But recently, some of the Google Webmaster helpers have been organizing Google + Hangouts. 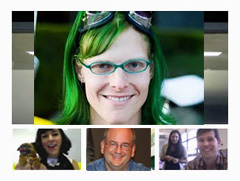 Google + Hangouts allow up to ten people to join the live chat discussion. Last time, Jenny Murphy and John Mueller were in the event, I happened to catch it and so did a few others. Here is a link to the first Webmaster Chat on Google +. When: Wednesday 31 Aug 2011 at 11:30am PDT for 1 hour. Topic: To help keep things focused, we'll be selecting a topic. This week's topic is +Snippets and schema.org markup. Honestly, it might start off talking about +Snippets, but they will answer almost any webmaster/Google related question, if they are able to.